The 2011 Hyundai Azera unveiled in Chicago. Boasts updated 3.3L and 3.8L V6 engines and improved fuel economy. The 2011 Hyundai Azera made its official debut at the on-going Chicago auto show. For the 2011 model year, Azera received a plethora of styling updates and technical improvements including enhanced V6 engines and new six-speed automatic gearbox. Speaking of powertrain options, the revised 2011 Azera is available with two updated V6 engines; the 3.3L and 3.8L. Entry-level Azera GLS is available with 3.3L Lambda V6 which generates 260 horsepower and 233 lbs.-ft of torque. The engine features variable valve timing on both the intake and exhaust side. It is also equipped with variable intake system (VIS) that further broadens its power curve to improve Azera’s off-the-line acceleration and passing performance. The 3.3L V6 engine returns 20 mpg in the city and 28 mpg when driving on highway. The 3.8-liter V6 fitted under the hood of 2011 Azera Limited also gets a horsepower bump, again thanks to the addition of variable valve timing on the intake side. According to Hyundai, the updated engine packs 283 horsepower and 263 lb-ft of torque. Estimated fuel economy for the 3.8L V6 engine is 19 mpg in the city and 27 mpg on highway. The updated 2011 Hyundai Azera also gets standard six-speed automatic transmission, which helps the car to improve its fuel efficiency and reduce emissions. According to Hyundai, the all-new 6-speed gearbox is smaller, lighter and more compact in size than any other six-speed transmission available on the market. It was developed over a four year period in conjunction with Kia Motors. The 2011 Azera also received a plethora of styling updates. Those are not dramatic, but do help the vehicle to look a bit more premium and modern. Styling alterations include subtly revised front fascia with redesigned front grille, headlights and bumper. In the rear, the 2011 Azera gains new LED taillights and slightly redesigned bumper with integrated chrome exhaust tailpipes. Modernized 17-inch alloy wheels and revised side repeater mirrors with all-new bright puddle lamps light the way to Hyundai’s refined premium large car with near-luxury attributes. Interior of the facelifted Azera benefits from aluminum graining added to the center console and a one-touch triple turn signal. All Azeras are also equipped with green “Eco” indicator light that lights up to indicate fuel-efficient driving habits. According to Hyundai Motor America, the 2011 Hyundai Azera is set to hit the showroom floor in the spring 2010. Pricing will be announced closer to its sales date. 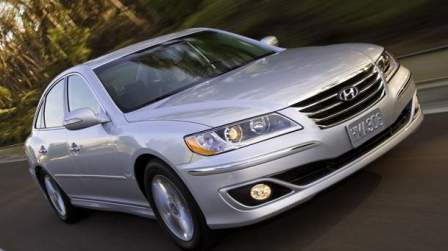 The 2011 Hyundai Azera adds power and efficiency to a model known for its luxurious appointments. The updated large sedan now includes an advanced six-speed automatic transmission and other powertrain refinements raising the bar on fuel economy in its class, while still gaining horsepower. The 2011 Azera will be available at Hyundai dealerships in spring 2010. All of these upgrades help illustrate why more and more customers are discovering how well Azera stacks up against the competition. Overall, the 2011 Azera is a strong competitor to vehicles like the Lexus ES350, Toyota Avalon, Nissan Maxima, Buick LaCrosse and Ford Taurus. Spacious and luxurious, the Azera features more interior volume than expensive luxury sedans such as the Mercedes Benz E-Class, BMW 750i and Lexus LS 460. Both Azera powertrains still offer more standard horsepower than the BMW 528i demonstrating that Azera is one of the smartest premium large-sedan choices available in the American market today. The Azera GLS is equipped with an enhanced 3.3-liter, DOHC V6 engine that now produces an estimated 260 horsepower at 6,200 rpm and 233 lbs.-ft. at 4,500 rpm of torque. The performance gains were achieved by incorporating Dual Continuously Variable Valve Timing (DCVVT) that improves engine breathing on the intake and exhaust camshafts for better fuel economy and lower emissions. Depending on engine load and speed, DCVVT can extend or shorten the duration of the valve opening and closing for more power. Previously, the 2010 Azera only had CVVT on the intake camshaft. Now, the Azera GLS features a specially tuned intake manifold surge tank to take advantage of the new DCVVT configuration. A member of Hyundai’s “Lambda” engine family, this new engine also has all-aluminum construction and four valves per cylinder. It also features a Variable Intake System (VIS) that further broadens its power curve to improve the vehicle’s off-the-line acceleration and passing performance. Fuel economy estimates for the Azera GLS are 20 mpg city / 28 mpg highway. Hyundai‘s commitment to making the Azera extremely fuel efficient continues with a six-speed automatic transmission with SHIFTRONIC manual control. This transmission offers smooth shifts and a wide ratio spread that ideally suits both engines’ characteristics. Hyundai’s all-new six-speed automatic transaxle helps the company meet its goals of improving fuel efficiency and reducing emissions. Shifts are silky-smooth with an option of manual control through the SHIFTRONIC feature. The transmission featured in the Azera cleverly integrates adjustment screws in the valves that enable each of the eight valves to be calibrated at the factory. This feature ensures stable hydraulic pressure at any shift point which facilitates a high degree of precision and control needed to deliver fast, smooth and precise shifts throughout the rpm range. Azera is reborn with a more handsome exterior design. The most noticeable exterior upgrade is a new sleeker front bumper fascia, with a number of subtle design tweaks. Design updates up-front also include redesigned headlamps, new chrome grille and round fog lights. A high-gloss window trim treatment enhances Azera’s profile. The rear of the 2011 Azera features new LED tail lights, a redesigned bumper with integrated chrome tailpipes and a matching decklid. Modernized 17-inch alloy wheels and revised side repeater mirrors with all-new bright puddle lamps light the way to Hyundai’s refined premium large car with near-luxury attributes. Overall, Azera’s proportions remain elegant, purposeful and aerodynamically efficient, reducing wind noise while adding maximum stability on the highway. Inside, Azera’s spacious cabin provides not only roomy comfort, but a luxurious look with a new attention to detail that makes both driver and passengers feel like they are riding in a luxury sedan. These details include a new brushed metalgrain finish applied to the gear shift indicator area, cup holder cover, ashtray cover and center console cover. For convenience, “EZ Lane Change Assist” (one-touch triple turn signal stalks) has been added as to long list of standard equipment. Slight movement of this new turn signal stalk will cause the turn signals to blink three times and then automatically go off – an ideal feature for highway passing. Special attention has also been paid to other interior details, such as the electroluminescent cluster display and steering wheel audio control functions. The blue backlighting for interior gauges, switches and buttons along with ion-plated accents highlight the vehicle’s modern appearance. Other unexpected luxury appointments include a power rear sunshade, integrated memory system and power-folding side mirrors with turn signal indicators and puddle lamps on the Limited version. Azera Limited also has a power tilt and telescopic steering wheel, electrochromic auto-dimming mirror with HomeLink, premium door sill scuff plates and woodgrain steering wheel and door pulls to its long list of standard equipment. Music lovers will also welcome the 2011 Azera’s inclusion of standard iPod/USB and auxiliary input jacks to accommodate and charge audio devices such as iPods. Additionally, the 2011 Azera offers impressive passive safety features including eight standard airbags, active front head restraints to help prevent whiplash, a Lower Anchors and Tethers for Children (LATCH) system for children’s seats and three-point seatbelts for all positions while shingle-style rear-seat head restraints provide drivers with improved visibility. Security is further advanced with an anti-theft engine immobilizer and remote keyless entry with alarm. LG, the South Korean-based international manufacturer of consumer electronics has developed an exclusive navigation system for the Hyundai Azera, Elantra and Veracruz models. Using touch-screen functions, the DVD navigation system comes equipped with a premium 605-watt Infinity Logic 7 surround sound system with 12 speakers, 11-channel digital amplifier and AM/FM/XM/CD/MP3 reception capability which replaces the six-disc CD changer and iPod/USB and auxiliary input jacks. It also includes mapping software for the continental United States and has available POIs (Points of Interest) for entertainment, shopping and dining. Route guidance is provided by audio and visual prompts. Hyundai engineers benchmarked the best cars in the category before designing the Azera’s double-wishbone front and multi-link rear four-wheel independent suspension system. By using high-tensile steel in critical unibody areas, the Azera features increased stiffness and rigidity, which ensures formidable resistance to flexing and enhanced ride and handling, while lowering interior noise levels. Attached to the Azera’s rigid structure is improved suspension and steering hardware to keep the vehicle even flatter through turns and more compliant over bumps. The suspension features four twin-tube, gas-charged dampers, softer bushings and a quick steering rack. The Azera also has front and rear stabilizer bars and rides on new 17-inch wheels and 235/55VR17 tires. – Woodgrain-trimmed leather steering wheel and door pulls. LG DVD Navigation system with touch-screen display (replaces in-dash six-disc CD changer and iPod/USB auxiliary input jacks) 12-speaker Infinity Logic 7 surround sound audio system.